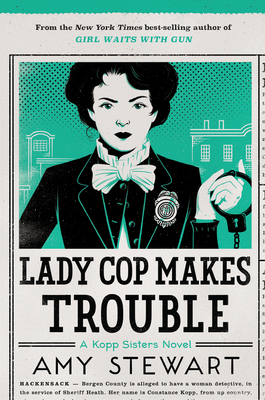 Lady Cop Makes Trouble is the second book in Amy Stewart's Kopp Sisters series. This time around we find Constance Kopp on a peculiar case. How is she supposed to track down an escaped prisoner when the details of his case are deemed too scandalous for a woman to hear? No one, from the deputies to the jailhouse guards and the very sheriff who appointed (unofficially) Constance a deputy, is a comfortable giving her any details. But that doesn't deter Constance. She will find the answers her own way! With some encouragement from her sister, Norma, and help from friends in New York City, Constance Kopp will find this mysterious prisoner and bring him to justice! Amy Stewart blends fact and fiction in Constance's latest adventure. It's a fascinating look into American life in 1915, where women are starting to carve themselves a place in a man's world.